Just so everyone knows. SliceTruck has pizza ovens on it and we cook the pizzas right on the stone. See? Abbot Kinney first Friday was a pizza eating windfall for the SliceTruck. Even though it was the second Friday. Owen Wilson was hanging around, first Fridaying it up, not buying any slices. Why? maybe because he just ate or is on a special diet for an upcoming role play or was going to a nice sit down dinner that he was super excited about. But it probably was because we might ask for a picture of him with the truck and make a big deal. The thing is that we wouldn't have and we'd like it to be known that we're the Chateau Marmont of pizza trucks. Anyway, we've got a big set of days coming up for the truck. Giant kids soccer tournament on Sunday we have to go to. I would hate to play soccer, knowing I had to wait til the end of the game to eat some pizza when the other teams that aren't playing get to eat pizza while you have to play. Soccer makes people starving, for orange wedges and hot pizza just like swimming. Dealt with the fuzz quite a bit tonight also. Twice is a lot to me. The problem is that there was some confusion and someone thought we were a toy store truck and called the cops because they confused themselves. To recap, if you're a cop in uniform, slices are free. 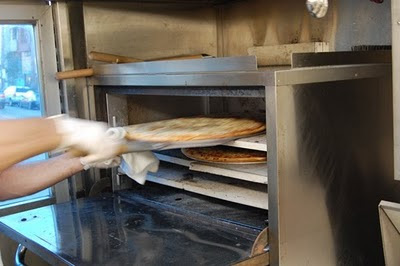 SliceTruck is a real pizza place with real pizza ovens. Major celebrities can keep a low profile while grabbing a slice and some events, like superbowls, just go hand and hand with SliceTruck. Just curious, how many pizzas you can bake at one time in your truck? And do you make your own dough? And Is it hand tossed fresh or frozen? We freakin' LOVED your pizza at January First Friday. You coming back to AK for the March FF? We might. AK stores get quite pissy with the Trucks and I'm not in the mood for the old stinkeye from anyone. Maybe we'll come and park on Venice. Once summer hits I think we might be spending everyday in Venice over by pacific and Washington. We put a schedule up for the next few days on this site, check it out and try and stop by. Thanks for the pizza compliment.